As a DJ, gearing up might be pleasurable experience, but in most cases, it’s a total drag. Finding your mixers, controllers, consoles, and headphones usually requires weeks, if not months, but we’re here to help you out as much as we can. We’ve compiled a list of the best cheap DJ headphones for your convenience, so without any further ado, let’s get down to business. Koss might not be the most famous brand in the DJ world, but wait until you’ve tried their ProDJ200 studio headphones out. 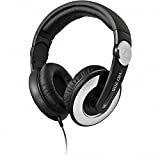 These headphones pack premium-quality noise-reduction technology, they’re wired, and come supplied with the exquisite KTC remote control that allow you to use them hands-free with your iPhones or iPads. The ear cups come with a stereo/mono convenience switch which is just one of the reasons we label them as one of the top DJ headphones under 100 dollars – simply flipping it off allows for easier monitoring of your tracks and mixtapes on one or both ears. The cord is detachable, so you can fold these headphones more easily. Overall, they’re great for the buck and provide high-fidelity sound. They’re very convenient and easy to use, plus certain features these headphones come outfitted with are exquisite – such is the case with KTC remote control and the integrated stereo/mono switch. Koss isn’t as famous as Sony, Audio Technica, or similar, so most people would shy away from trying them out. Apart from that, they’re not exactly durable – you’ll need to handle them with extra care, or they might crack at certain points. 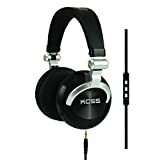 If you want headphones that will give you the best DJ experience, you should give Koss ProDJ200 a shot. This is a great budget option for people who don’t mind the flimsiness of their construction, which appears to be their only flaw. Audiophiles and DJs alike simply adore Behringer’s headphones, and for a good reason too. That’s why we’re reviewing them this time around. These headphones boast highly detailed bass and transparent high frequencies, the dynamic range is very high, and you simply can’t ignore how beautiful these headphones are. DJs require high-definition bass, and that’s exactly what HPX2000 provides. On top of that, the dynamic range is huge, so you’ll hear everything, and we mean “everything” while using them. On a side note, you’ll look very cool with them, as they excel in aesthetics like no other. To top it all, they’re shamefully cheap, even for a budget headphone set. Beauty always has a price, and the case with HPX2000 is that they’re a bit too bulky for comfort. It’s hard to find a good headphone pair in this price point category, but Behringer delivered. For DJs that are quite low on cash, they might be the best option. In essence, HF325 are very convenient and provide high-fidelity sound. They feature premium-quality drivers that work like a charm while handling professional grade mixers or DJ controllers. The bass response is excellent, but not as detailed as with boutique-level headphones. The earcups, on the other hand, are so comfortable that you’re likely to end up finishing the gig and going to sleep with them still on without even noticing. Lastly, the reason why we dub HF325 as one of the best cheap DJ headphones is because they feature unparalleled ambient noise reduction. The crowd can go as wild as they please, and you won’t hear a thing unless you actually want to. Unmatched ambient noise reduction, studio-grade sound quality, and outstanding comfortability are just some of the benefits HF325 bring to the table. The only real downfall of these headphones is their flimsiness. They’re made of quality materials, sure, but if you abuse them you will end up destroying them sooner than later. DJs in-the-making and those lacking the money to buy boutique-level DJ headphones should at least consider these headphones. This model has it all, but lacks in the durability department. All things considered, its overall value for the money is quite high. AKG headphones are, without exception, ideal for DJs, regardless of the model you pick. We’ve chosen their Pro Audio K167 Tiesto for our review as they’re not as expensive as the other models from this electronics giant. They come with premium-quality 1,6-inch drivers that provide plenty of handling power, and they’re built from exquisite XPR reinforced-polymer materials. The earcups are oversized, though comfortable, and the headband feels pretty nice when worn too. It’s the quality of sound that made them so great, in all truth. The features of these headphones aren’t exactly perfect, but they’re substantially better than average. They’re very easy to use due to the lack of specialized features (such as switches, remote control, or other convenience features), which can be considered as a flaw if you’re a pro, but that’s a huge benefit if you’re a beginner. The build quality leaves a lot to be desired – they tend to dangle to and fro if you’re not actually holding them, so even though the plastic bits and pieces will remain firm, the cords and wires will burst if you’re not handling them properly. Great sound, decent features, very comfortable to wear – even though they’re flimsy in general, they are definitely worth considering. Let’s pull the curtain down with another headphone model from the Senheiser’s stock. We’ve saved HD 205-II for last as these headphones are truly a treat if you’re looking for premium-quality, yet affordable DJ headphones. The earcups are rotatable and incredibly simple to clean, the bass is deep, and general audio reproduction is beyond smooth. On top of that, the ambient noise reduction is outstanding, and the construction rugged. Simply put, these may be the best cheap DJ headphones. At first sight won’t be able to tell whether Senheiser’s HD 205-II are plain or professional grade headphones. They look relatively uninteresting – the standard-size earcups and oh-so-regular headband won’t actually appeal to everyone. However, most audiophiles and professional DJs will tell you that you can’t go wrong with Senheiser. We tend to agree, and what we liked about these headphones is, for the lack of better words – everything. They’re superior in terms of durability and audio reproduction to every model we’ve reviewed so far, and they come with several convenience features which make them absolutely ideal for DJs of all skill levels. The only thing we’d like to see improved are the earcups – they’re padded and comfortable alright, but they’re not as durable as the rest of the construction. Senheiser’s HD 205-II are among the most valuable headphones for DJs, even if we’re to forget that they’re affordable. They provide everything a DJ needs, and we highly recommend that you give them a shot. 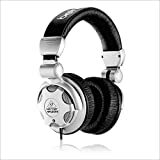 Regardless of what’s your brand of preference, this review should suffice to help you find a good pair of DJ headphones under 100 bucks. 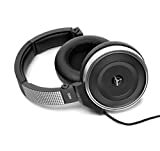 Senheiser’s just a bit above other brands this time around, but don’t let that dissuade you from trying out Koss or AKG – these are all premium-quality, yet cheap headphones that we guarantee that you will love.